Finally, we examined participation in full- versus part-time preschool enrollment using CPS data. 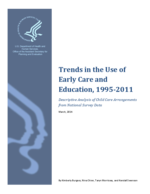 The percentage of three- and four-year old children in part- and full-day preschool were similar and did not change greatly in the period from 1995 to 2011. Full-day preschool enrollment among children ages three and four increased slightly from 22 to 24 percent, while part-day preschool remained unchanged (Figure 29; CPS Table 1.7). Full-day preschool enrollment increased among children with employed mothers from 26 to 31 percent though there was no change for children of non-employed mothers (Figure 31). Not surprisingly, children with employed mothers were consistently more likely to be enrolled in full-day preschool. However, children with non-employed mothers were just as likely and in some years slightly more likely to be enrolled in part-day preschool than children with employed mothers.